Scott Robson celebrates scoring against Basingstoke. Scott Robson knows all about play-offs glory. The popular defenceman was part of the Phantoms team which claimed English Premier League honours in 2015. He is one of six survivors from that successful roster who feature in the club’s current set of silverware stars – captain James Ferrara, his younger brother Robbie Ferrara, player-coach Tom Norton, Will Weldon and Martins Susters are the others. And Robson (23) can’t wait to head back to Coventry later this month for the NIHL Final Four with Phantoms assured of a tilt at the final trophy of the campaign. 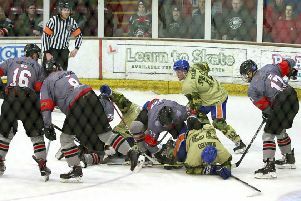 But there is more pressing business to attend to this weekend as they first attempt to capture their third trophy of a stunning season which has already featured NIHL Autumn Cup and NIHL South Cup successes. They face Bracknell in the final of the NIHL Division One South play-offs with a Saturday trip to Berkshire (6pm) followed by a second-leg decider at Planet Ice on Sunday (5.30pm). Phantoms earned their place by seeing off Basingstoke at the semi-final stage last weekend while Bracknell claimed the impressive scalp of league champions Swindon. “It’s great to be able to look forward to going to Coventry again, but first we want to win the South final,” stated Robson. “It would have been tough to face Swindon, but it will arguably be just as tough against Bracknell. Any team can beat any other in the play-offs. “We need to put them to bed, lift another trophy in our rink and then head to Coventry with the aim of winning the Final Four as well. “It would be nice to go down in history as one of the best Peterborough teams and we know what’s at stake. “We have a lot of young players here, but we also have plenty of experience. We appreciate what we’ve achieved so far and understand what could lie ahead. “To have two trophies in the bag already is brilliant but it will be unbelievable for everyone involved, and the fans, if we can add more silverware. That English Premier League play-offs triumph of 2015 came at the end of Robson’s debut campaign with Phantoms. The 23 year-old is nearing the completion of his fifth season with the city club and recently passed the milestone of 250 appearances.